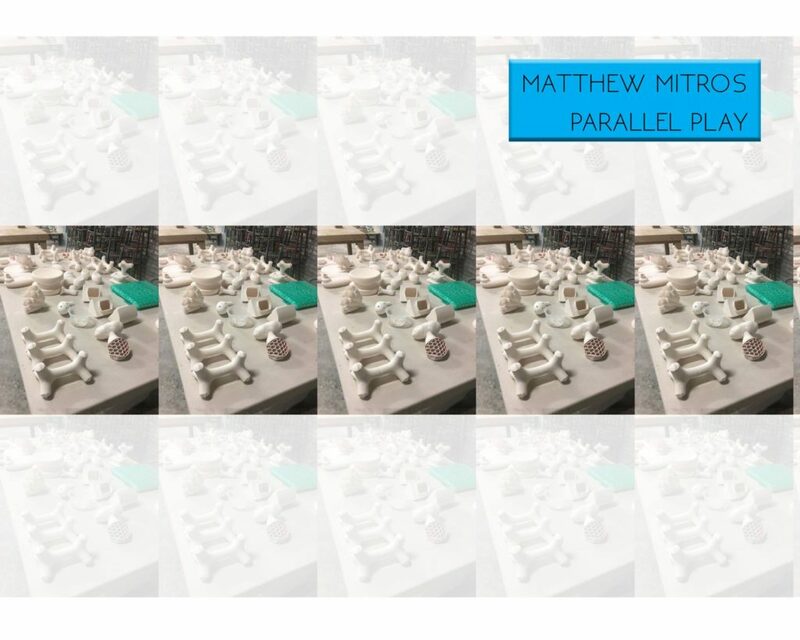 SOUP experimental will open Matthew Mitros’ exhibition PARALLEL PLAY this Friday, August 4th from 7-10 PM. The exhibition will run through August 26th. Mitros’ work focuses on the creation of illusory acts of tension within a forced fusion between what is seemingly organic in form/behavior and what is clearly machined. The Organic, epitomized by his use of rough surfaces and plant-like shapes, is determined by Nature – in various states of decay. The Machined, as suggested by the clean lines of the slip-cast objects, is fabricated by the rules of Man — products of our intent. Both, however, can be equally represented as natural. The machined object is the result of our ability to operate within the parameters of natural systems. The organic object is an agent that symbolizes a moment within these cyclical systems.The difference between these two lies within their inherent goals: the organic is predicated by a struggle for survival, whereas the machined is predicated for efficiency. Matt Mitros was born in Philadelphia, PA. Upon completing his BFA in Ceramics at Penn State University, he was an Artist-In-Residence at Arrowmont School of Arts & Crafts as well as the Archie Bray Foundation. Mitros completed a post-baccalaureate from the University of Illinois and holds an MFA from the University of Washington. He has taught ceramics and sculpture at the University of Washington, South Seattle Community College, Lakeside Upper School, Kennesaw State University, and is currently a tenure-track Assistant Professor of Art at the University of Alabama. In 2014 Mitros was a Short-Term Artist In Residence at Red Lodge Clay Center. In 2008 Mitros was an Artist Trust GAP (Grant for Artist Projects) recipient funded by the City of Seattle. His work has been featured in Art in America, Art LTD, Clay Times, Ceramics Monthly, and City Arts Magazine, as well as the book 500 Figures in Clay. Mitros has exhibited work throughout North America and Europe. His work is in the permanent collection of the National Museum of Slovenia, The Archie Bray Foundation, and Bemidji State University.